Dynamic Saunas offers a nice selection of infrared units, priced from about $800 for their smaller units all the way up to almost $5000 for their 6 person saunas. Sold from online merchants such as Amazon and Wayfair, they have become very popular in recent years. 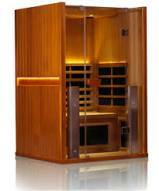 Dynamic makes far infrared saunas of various sizes and styles to accommodate all users. They are all low EMF and are made of reforested Canadian hemlock. All of the saunas have double paneled walls made of thick wood planks for more efficiency. The least expensive model is the Alicante, which features 4 Bio-Ceramic heaters, dual control panels, LED display, mp3 connection and speakers, and two side windows. It costs around $840 when it's on sale. Moving up you have the popular Barcelona, with 6 Carbon Heating Panels, soft touch controls, LED display, mp3, speakers, pre amp and one front mounted window. The Maxxus Toulouse is similar to the Barcelona feature wise, with two side windows plus radio with CD. It's a lighter shade than the Barcelona as well. 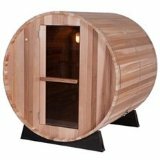 Check out all of the Dynamic Saunas on sale now at Amazon! 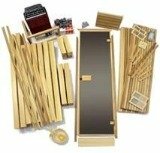 Rounding out the 1 to 2 person Dynamic Saunas are the Valencia, Bilbao, Versailles, Andora, Venice and Milan models. All of these models feature 6 heating panels and are a bit fancier as you move up the line. The most expensive 2 person unit is around $1600 on sale. The three person units are the Maxxus Marseilles, Maxxus Reims, Madrid and Palermo, and feature 7-8 low EMF panels and varying designs and layouts. A few of them have Bluetooth capability. They cost between $1600 and $1900 on sale. The most expensive unit is the 6 Person Dynamic Sauna Monaco. It has 15 heating panels, FM-CD radio, two reclining beds and two benches, chromotherapy and 15" monitor. It costs around $4,800 on sale. There are many advantages to Dynamic Saunas. For starters, they are very affordable. They tend to run at about half the price of the higher-end brands such as Clearlight, although there is a difference in quality. Another advantage is low EMF (electromagnetic field) ratings on their infrared heaters, which is a measure of their emissivity. The lower this number is the less damaging it is to our bodies. So always look for saunas with low EMFs and low ELF (extremely low frequency). A third advantage is easy installation. Most of the Dynamic Saunas can be put together in under 1 hour. Only the largest units require a dedicated electrical hookup. There aren't too many cons here. But if we have to mention something it would be the fact that we weren't able to find any research backing up the claims of low EMF. So we have to take the company's word for it. The parent company of Dynamic is Golden Designs Incorporated, based in Ontario, Canada. 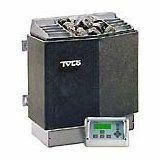 Looking at their website there is not a lot of information about where the saunas are made, how they are made, certifications, testing, any of the kind of information that you usually find. The company also sells massage chairs, rowing machines, spas, heaters and paddleboards, so it appears that they are more of a distributor than a manufacturer. But it's hard to know for sure. So our main gripe would be that there isn't a whole lot of information available on the Dynamic Saunas. Dynamic Saunas have received great reviews from users, with a majority of them being more than pleased with their results. Keep in mind that they are not the highest of quality, they are more of a discount brand for the masses. This is not to say they won't deliver the intended health benefits, they just aren't up to the standard of a Clearlight or a Sunlighten, which can be up to twice the price. So if you are looking for a home sauna but don't have the budget for a top of the line model, Dynamic Saunas might be the way to go for you.